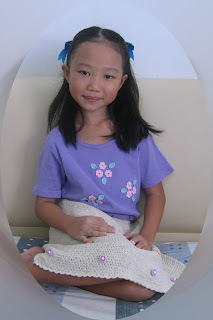 This girl loves flower ... so her mum added some simple crocheted flowers on her plain t-shirt. She likes to wear it in pair with the skirt her mum made quite some time ago. As requested, I've provided the link to the Butterfly pattern.